Total L = 130; bell body L = 74, max W = 75.5, max th = 51; mouth diam = 56 x 20; clapper diam = 9.5 x 9; cord W = 3 mm [RTS 5/9/2005]. Clapper bell made from the hollowed out shell of a dom nut, cut flat across the mouth. The surface is a mid brown colour (Pantone 7533C), and shows signs of wear around the lip and upper part of the body. Two rows of circular holes have been bored into the walls, one running horizontally around the circumference and including 2 partial holes that were never completed, and the other running at right angles to this, up the sides and over the top of the bell. The uppermost pair of the latter have been threaded with a yellow suspension cord (Pantone 7508C), made from a twisted strip of hide with the ends tied in a loose knot. A second strip of hide, not twisted, has been attached to the base of this loop, inside the bell body, and that in turn has been fitted with a brass ring, which runs through the upper body of the clapper. The clapper has been carved from a short piece of soft yellow wood (Pantone 7508C), and has a cylindrical body and flat cut end that hangs down below the mouth. The bell is complete and intact, and has a weight of 42.8 grams. It has a total length of 130 mm; the bell body is 75 mm long, with a maximum width of 75.5 mm and thickness of 51 mm; the mouth measures 56 by 20 mm across. The clapper has a diameter of 9.5 by 9 mm, while the cord has a width of 3 mm. Collected by Edward Evan Evans-Pritchard during his first or second season of fieldwork amongst the Nuer, from February to April 1930, or in 'the dry season' between February and June 1931. In the former, he spent around three and a half months in Leek territory at Yahnyang and Pakur on the Bahr el Ghazal, in Lou territory at Muot Dit, and at Adok, amongst the Dok Nuer. In the latter, he spent five and a half months at Nasir, on the Nyanding River, and at Yakwat on the Sobat River (see E.E. Evans-Pritchard, 1940, The Nuer, and the map of Evans-Pritchard's fieldwork in D.H. Johnson, "Evans-Pritchard, the Nuer, and the Sudan Political Service", African Affairs 81 no. 323, p. 233). This example was designed to be worn singly, and would have been hung around the neck of a bull or ox. Groups of these bells were also made into collars for bull calves and oxen; see 1948.2.165, and an additional example published in E.E. Evans-Pritchard, 1940, The Nuer, p. 187, fig. 13; some of those nuts had groups of 4 holes through their sides, reminiscent of the multiple perforations seen in this example. Evans-Pritchard tells us that these kinds of necklaces were placed around the necks of oxen and "Even the bull calves are adorned by their boy-owners with wooden beads and bells" (Evans-Pritchard 1940, p. 37). Amongst the Zande, strings of similar bells, made from the doleib palm ( Borassus flabellifer) are worn by witch-doctors around their waists during dances (see E. E. Evans-Pritchard, 1937, Witchcraft, Oracles and Magic among the Azande, p. 157 and pl. XIV). Similar bells shaped from the seed shells of the borassus palm are found amongst the Amba and Konjo of Uganda; these have a double clapper (M. Trowell & K.P. Wachsmann, 1953, Tribal Crafts of Uganda, pl. 77A-B). Rachael Sparks & Chris Morton 19/9/2005. Accession Book Entry [IX, p. 16] 1931 [insert, in pencil] 66 [end insert] E. EVANS-PRITCHARD , Esq. Dec. Specimens collected by himself in the EASTERN SUDAN, viz. [pencil insert, p. 18] 27 [end insert] - Single cattle bell of similar type ["Cord with 8 pendant clapper bells (large nut-shells with wooden clappers)"], NUER. Card Catalogue Entry [tribes] - E. SUDAN, NUER. 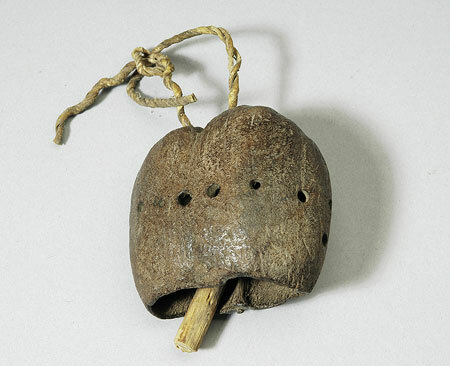 Single cattle-bell, large nut-shell with wooden clapper. Coll. by donor. d.d. E.E. Evans-Pritchard, Dec. 1931 [RTS 23/7/2004]. Pitt Rivers Museum label - Nut-shell bell for hanging on necks of cattle. NUER. E. SUDAN d.d. E. Evans Pritchard 1931 [rectangular metal-edged tag, tied to object; RTS 1/9/2005]. Sparks, Rachael. "Nuer clapper bell" Southern Sudan Project (in development). 03 Jan. 2006. Pitt Rivers Museum. <http://southernsudan.prm.ox.ac.uk/details/1931.66.27/>.